Are Happy Days Here again? Not for buyers. My very favorite valuation system, FNC has confirmed the trend that is causing all the singing. I trust FNC, because their data includes information about house improvements (or lack thereof.) Here around Boston, where house condition is a key factor in valuation, FNC gives me the best information. The national survey numbers are here on their chart. 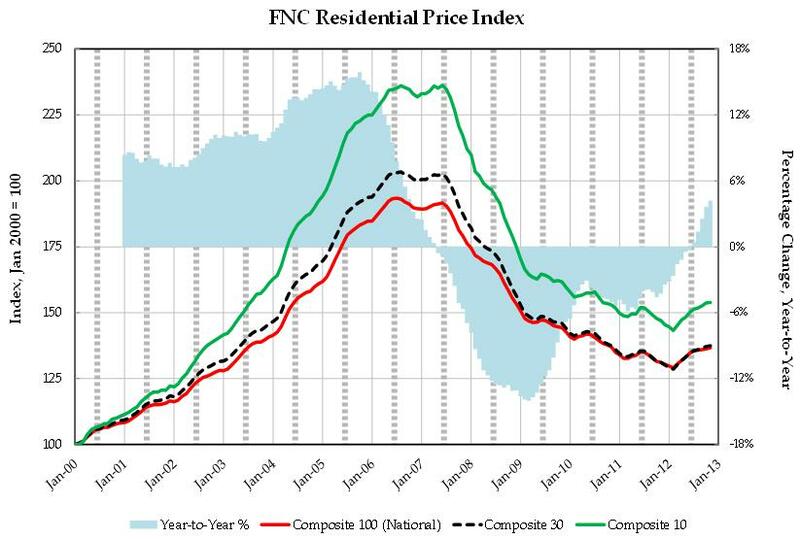 Notice the bubble lines on the three levels of composite indexes that FNC creates. They are pretty pronounced. The songs of joy are because of the little tail of blue above the zero shaded blue year-over-year data. Now for a little fun with numbers. Go to the FNC data page On the Filter bar, choose “All Northeast Region MSAs” Date range: January 2000 to January 2013. Then hit the green “Compare” button on the right. The Northeast data is limited to New York and Boston. Look at Boston MSA compared to New York MSA. Boston rose faster, but not as high. Boston hit bottom sooner and has been bouncing along the bottom for the past three years. New York hit bottom in 2011, a full two years later. You can tell that these guys are from the South, since they are claiming Washington DC and Baltimore in the Southern region. Add them in and take a look. You’ll see that Boston had a pretty mild bubble compared to Northeast and Mid-Atlantic cities in this Index. The Mid-West region had no profound bubble, except for Minneapolis. In the South, the bubble was muted in Atlanta, the Texas cities, Nashville, and Charlotte. In the West, Denver didn’t have much bubble at all. California went nuts; quite the camel hump. Southwest cities went up, and then fell much harder, due to overbuilding.